To be honest, this is my first relaxing night in what feels like forever. 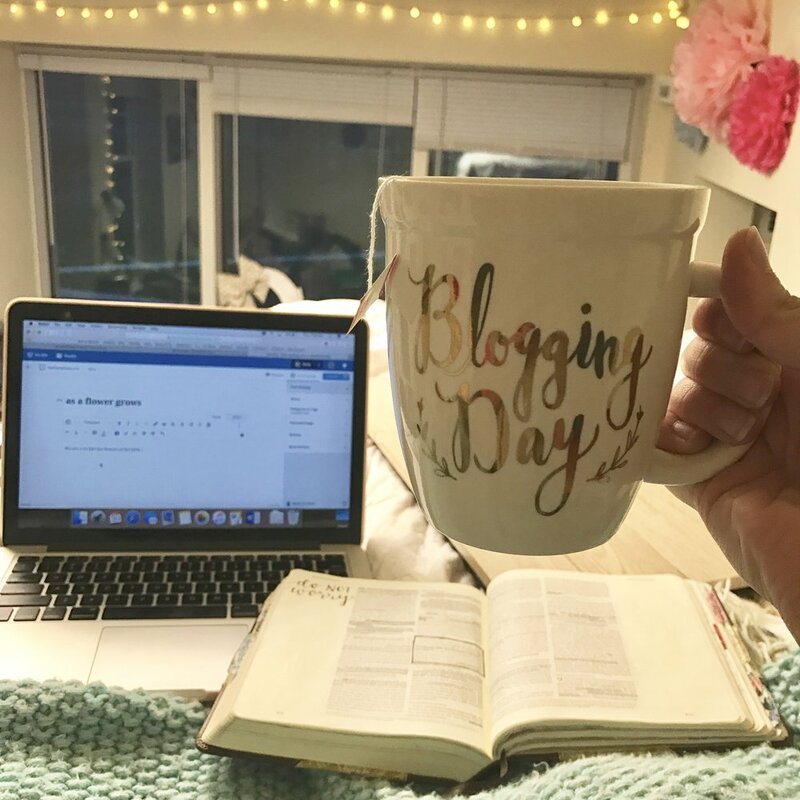 I just made myself a cup of white berry tea, featured in the picture to the right, and I sat down to write a blog for fun, and it's not even 8pm. Life this past semester has been so crazy busy, but I would not trade it for anything. I have gotten to travel and teach teenage girls about Jesus almost every weekend, and I have spent my days at school learning more about how to minister to people! However, during this time, it has definitely been a struggle to keep my own relationship with Jesus ever-growing rather than becoming distant or complacent just because I've been distracted. Today, I want to talk about how important it is to find quality time for Jesus in the midst of our busyness. It's something that I still struggle with daily. Even though I've scheduled time out of my morning to spend with Jesus every day, sometimes I'm not fully there because I didn't get enough sleep, so I start to drift off while reading my Bible, or I have a hundred things racing through my head about what I have to do that day, rather than who needs lifted up in prayer. How many of you can relate? I've been reading through the gospels and the other day, Mark 1:35 struck me. It says, "And rising very early in the morning, while it was still dark, he departed and went out to a desolate place, and there he prayed." When I read this, it jumped out to me that if the Lord of all creation needed to distance himself from the world to talk to his Father, how much more so do we, people of the world, need to do the same? The past few weeks, my quiet time in the morning has been anything but distanced from the world. I kept trying to focus on God, but Satan kept putting random thoughts in my head about something else, anything else but what I needed to be doing in that moment. Sometimes, I would get the urge to check Instagram (which might sound silly, but it happens) or I would think of something I needed to ask someone before I forgot, so I would pick up my phone and text them. Things like this just kept happening day after day, and before I knew it, half my quiet time was wasted away. So yes, technically I spent time with Jesus, but the problem was, I wasn't alone with him like I wanted. It was me and him + ________. Fill in the blank. I feel like this happens to a lot of us. How has your quiet time been recently? Have you felt like you're going through the motions? Have you felt distracted or distant from God? Do thoughts of your classes, kids, or coworkers pop in your head when you're trying to spend quality time with Jesus? I've struggled with being still when there's so much going through my mind, but last week when I started to realize how much I've been getting distracted, I started praying against distractions, and finally, yesterday and today, I didn't feel distracted anymore. I was able to be still in his presence and simply read his word and talk to him. I also had to take practical steps to make it work. I put my phone out of reach of where I have my quiet time. I won't let myself check social media until after I've spent time with Jesus that day. And, I started using a short devotional app to read the minute I wake up rather than scrolling through Instagram and Facebook before I even get out of bed. Do you need to take any practical steps in your quiet time to rid distractions and draw nearer to the Father? Maybe it looks like having your quiet time in a silent room at your house or maybe finding a different time of the day to do it. Or maybe you haven't picked up your Bible or uttered a prayer in days or weeks, and you want to start again. Whatever it is, I pray that your sweet quality time with Jesus may increase as you draw nearer to his throne of grace.